Speaking at the launch ceremony for the Car Lab at Shalun Green Energy Science City, Tsai said that the government is leaving no stone unturned in helping Taiwan companies explore the potential-laden industry. The testing site will help local manufacturers close the gap on global market leaders and carve out positions in future autonomous vehicle supply chains, she added. Overseen by the Ministry of Science and Technology, Car Lab is capable of replicating real-world traffic conditions from various nations. It also enables research on a host of vehicles ranging from cars to medium-sized buses and RVs. 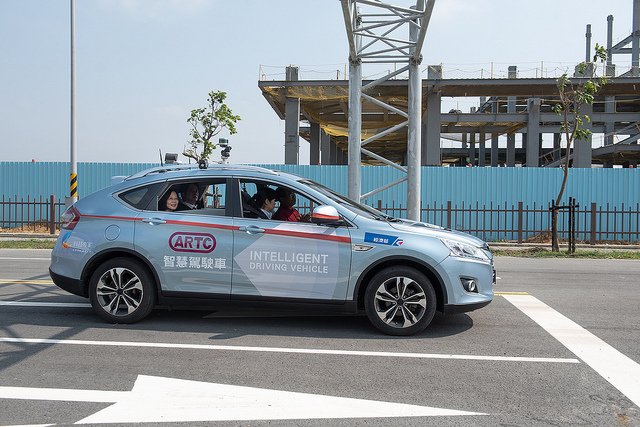 According to Tsai, driverless technology requires advanced capabilities in areas spanning artificial intelligence, Internet of Things and remote sensing and computing. Strengthening the nation’s expertise in such fields is a core goal of the government’s five-plus-two innovative industries initiative, she said. A key plank in the president’s national development strategy, the initiative targets the high-growth sectors of biotechnology and pharmaceuticals, green energy, national defense, smart machinery and IoT, as well as two core concepts: the circular economy and a new paradigm for agricultural development. Other government measures to support the development of self-driving vehicles include legislation by the Ministry of Economic Affairs to promote related R&D and a Ministry of the Interior program to compile high-quality 3-D road maps of major metropolitan areas. Tsai said that the Ministry of Transportation and Communications and Cabinet-level Financial Supervisory Commission are also working on regulations in areas like traffic models and insurance in preparation for the real-world implementation of related technologies.